6.25 points at 8 votes (rank 581). 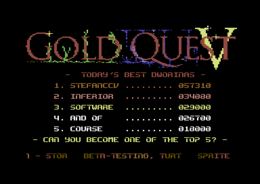 Gold Quest 5 continues the action adventure series and takes place some years after Gold Quest 4. This time, the player takes over the role of Dworina, the dwarf girl, who wants to free his boyfriend Sledgie from the captivity of the evil demon. The demon has damned the whole realm of the dwarves, so that many animals and plants were mutated. 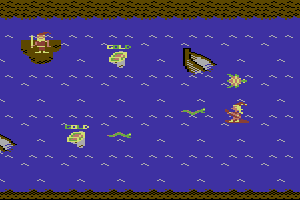 Dworina at the start of her adventure in level 1. The adventure starts in level 1 in a swamp landscape with many swarms of flies in the rivers, trigger-happy salamanders, huge mosquitoes and spore-shooting plants. To survive in this level, Dworina needs to collect as much gold as possible. But beware, there are many swamp holes into which she can sink. Some swamp holes are inhabited and they throw poisened lumps randomly around. Next to the Gold, Dworina can also collect Magic Stones. The Life-Stone gets her one life, the shooting range of the axe can be doubled with the POW-Stone and the GOD-Stone makes the dwarf temporarily immortal. 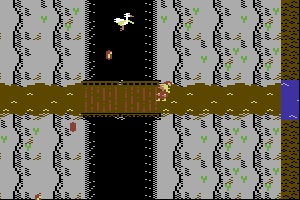 Dworina crosses the 2nd level on a raft. Dworina while climbing up the dwarf mountains in the 3rd level. After the rapid crossing of the river Dworina gets to the border of the Dwarf Mountains and needs to continue on foot in level 3. The rise is very laborious. The dwarf girl needs to take care not to accidentally fall into one of the deep canyons. The mountain is inhabited by many mutated birds. These throw stones and other debris onto the brave girl. Dworina also finds mutated edelweiss and meets some familiar faces from level 1. It is also here important to collect all gold and all magic stones if possible. At the end of the level lurks another mean huge spider. Then in level 4 Dworina gets into the Demon Cave. Unfortunately, there are not concrete hints about it. Except for that Sledgie is held captive there and a huge demon guards the cave. The game was realised with Sideways SEUCK. In the run-up the story was written (Richard Bayliss and Camailleon) and agreed upon in the Gold-Quest-team. 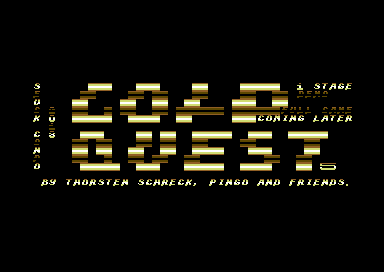 Pingo (new in the Gold Quest-team) has as a first step pixelled the background graphics and the title screen on the basis of the story. Then the sprites were created and pixelled (Sledgie, Camailleon, Pingo, Mary-Ann-Sammy and Richard Bayliss). The placement and animation of the objects (composed sprites), values (score, shooting range) as well as the adaptation of the background graphics (Sledgie) were optimized with several beta tests by (Stefan Egger, Camailleon, Telespielator, Pingo and Richard Bayliss). Finally the finished SEUCK-version was amended by Richard Bayliss concerning the programming of the highscore table, the magic stones were activated (Life gives an additional life, etc. 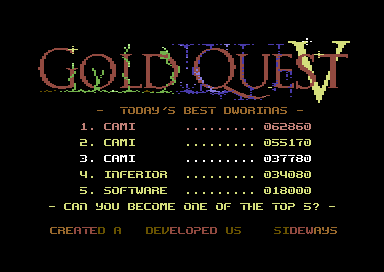 ), title, start and end screen as well as a final screen were added, the changing of the pawn between the levels (Dworina, changing from level 1 to level 2 onto a raft, etc.) was realised and the title and ingame music were composed. Here he was geared to the previous versions of the Gold Quest series. Gold-Stone Each one gets you 1.000 points. Therefore 10 Gold-Stones get you a life. Life-Stone Each one gets you 1 life and 10 points. Power-Stone Doubles the shooting range and frequency of the weapons (2 axes or lances can be thrown). Stays until Dworina loses a life and scores 20 points. God-Stone Makes Dowrina invincible for a certain time and scores 30 points. Key The key opens Sledgie's dungeon and adds 2.000 points to your score. ... After Dworina has defeated the demon and freed Sledgie from his dungeon, this final message appears. Finish level 1 to level 3. Then find with Dworina the demon in the demon cave (level 4) and defeat him. With the key she finally opens the dungeon and gets to her beloved Sledgie. Many plants and animals can well be killed with diagonal upwards or downwards shots. In any case use the GOD-Stones and the Life-Stones. No cheats known for this game. 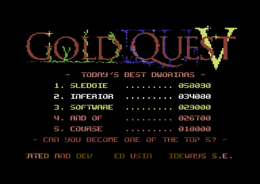 Sledgie: "The development of Gold Quest 5 was very much fun for me in the well-established Gold-Quest-team. As a result an elaborate medium-heavy action adventure emerged. The new game objects make the game solvable also for non-arcade players.". Stefan Egger: "As already with the forerunners, the development was very interesting to follow. As part of the team since the first GQ parts I can say that the games has developed itself further and graphics, ideas and sound got better with every part. As a beta tester I hope that I have forwarded the right tips for optimum fun in the game towards the developers and with this would like to thank all GQ team members, which are partly in contact every now and then for years, connected also by the great, shared project "Gold Quest". The highlight for me is level 2 (and the animation when you sink ;)) as well as the very good SID music by Richard Bayliss!" 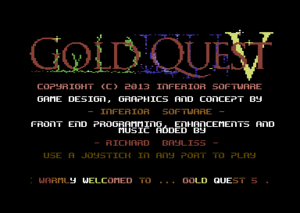 A demo of Gold Quest 5 was issued before the actual release. It took part at the SEUCK-Compo 2013 and reached place 10. In the demo only the 1st level can be played and the magic stones do not work yet. Richard Bayliss has added older SID songs to tthe demo. Currently there is no cover for this game. This page was last modified on 31 December 2015, at 02:11.